08:00hrs pick-up from Hotel’s lobby in Kuching and start your journey to Semenggoh Orang Utan Rehabilitation Centre situated about ½ hour drive from Kuching, here, the orang utans are being nurtured to readapt themselves to the jungle life. 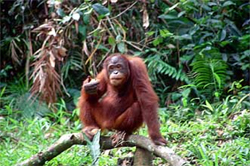 You will have the chance to observe the Semi-Wild Orang Utans coming out of the forest for the feeding time. Before arriving at the feeding platform, you will have a brief experience walking through the amazing untouched rainforest. 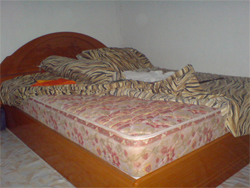 After which, proceed to Peraya Homestay 3D/2N fullboard package. Upon arrival, introduce to the host family, lunch and continue with caving, visiting the ancients head house which hosted the hundred skulls and continue to visit waterfall. Back in late evening, dinner and Settle for the night. Breakfast, wake up to the merry chipping of the birds. Trekking through secondary forest and rubber garden, pepper garden’s, cocoa gardens and fruits orchard. Learn about the wild herbs and plants that play important role in native lives. 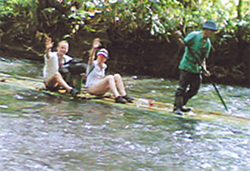 Animals can be encounter along the journey if lady luck was with us and enjoy the serenity of the jungle. Breakfast, bid farewell to the host family and continue the journey with visiting traditional Annah Rais Longhouse (Bidayuh). 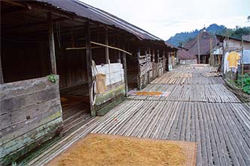 The Annah Rais Longhouse which stands on the same site where the longhouse was first built 200 years ago with its unique architecture built largely of bamboo, wood and leaves. The Bidayuh are absolutely warm and gentle people whose previous generations once lived as farmers and believed in animism. After tour, return back to Kuching with lunch at local restaurant and transfer to the hotel in Kuching or Kuching International Airport.